ITBP has proposed making a permanent stationing of one battalion of its paramilitary personnel at Hollongi in Itanagar. This is viewed as being essential to base the ITBP command in the state capital rather than in the existing location far-away in Shillong and Tezpur for efficiency in command control. 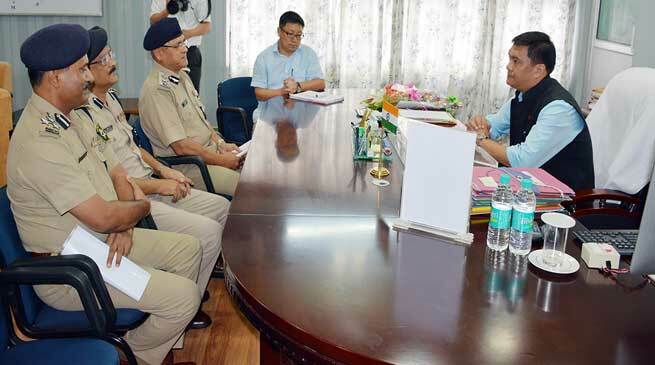 The proposal made by Manoj Singh Rawat, IG, ITBP called who on Shri Pema Khandu, Chief Minister to discuss on expanding ITBP establishments in the state and on improving security in the state and in the borders. The paramilitary force has also proposed for establishment of 54 border outposts along the McMahon line, which will be of useful assistance to the Army as well. Further, the ITBP conveyed its plan to open new sectors across the state in towns like Likabali, Pasighat and Aalo. ITBP official informed that besides guarding the borders, the paramilitary force will also be deployed to guard all essential government installations, offices and institutions in the state. The expanded ITBP resources can be of use to facilitate development and to transport PDS and other essential items to the borders so that stress migration from borders can be prevented, informed the official. Chief Minister agreed to extend all possible cooperation to the paramilitary force in expanding its establishment in the state. He appreciated the role of ITBP in maintaining peace and security in the state, and also lauded the humanitarian assistance extended by it during natural calamities.